Ran the Cinco de Miler this past Saturday, my fourth race overall, and the first race I submitted past results for corral assignment. Exciting! I got put in Corral C (of A-H). This was the first race I felt pretty good and not too stressed out about beforehand- so I feel like I’m starting to get the hang of it. A five mile race fit perfectly into my current training schedule for the next half marathon I’m running, so I just approached this race like a normal but speedy Saturday run. We got to the race start at the South lot of Soldier just after the suggested arrival time of 7:30 am for the 9 am race start. We were super early, which would have been much nicer if it were a warmer day. But we had plenty of time to warm up and stretch in the foggy cold and take some pics. And, we got to hear the mariachi band playing pre-race. First race I did that the organizers (Ram Racing) had pics being taken by a flying drone, that was neat. First time I spotted a guy (in Corral A! so he must be legit) run barefoot. First time I saw a blind (I think) person being led by tether by another runner- that was really neat to see. They were fast. First time I got to see video of myself at the finish line- Ram Racing had cameras set up and links to your video at the race result website. Kind of weird to watch myself run. First race I clocked an overall pace of < 10 min/mile pace! Woot! First time I had horchata, which is sort of unbelievable given I lived in New Mexico for six years. 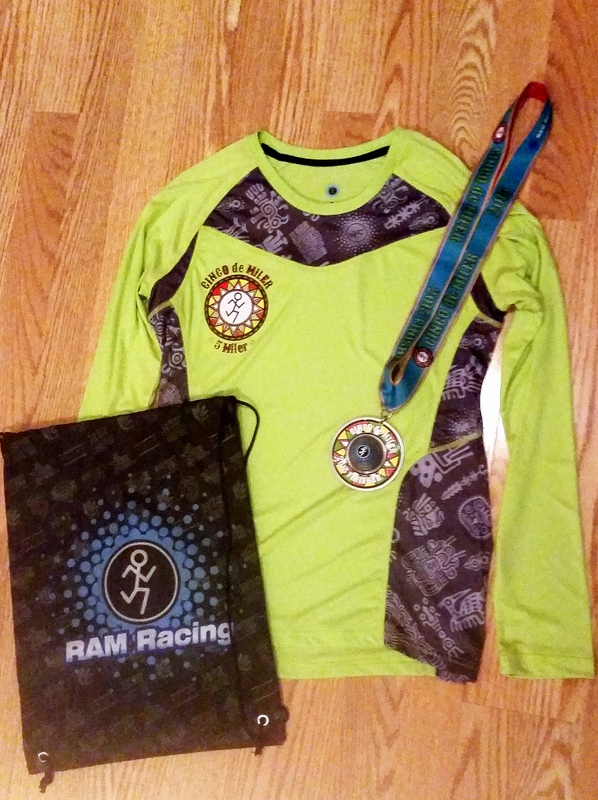 2015 Ram Racing Cince de Miler long sleeve technical shirt, super silky (I got a Womens' small- fits well), a drawstring bag, and a sombrero/botle opener medal. 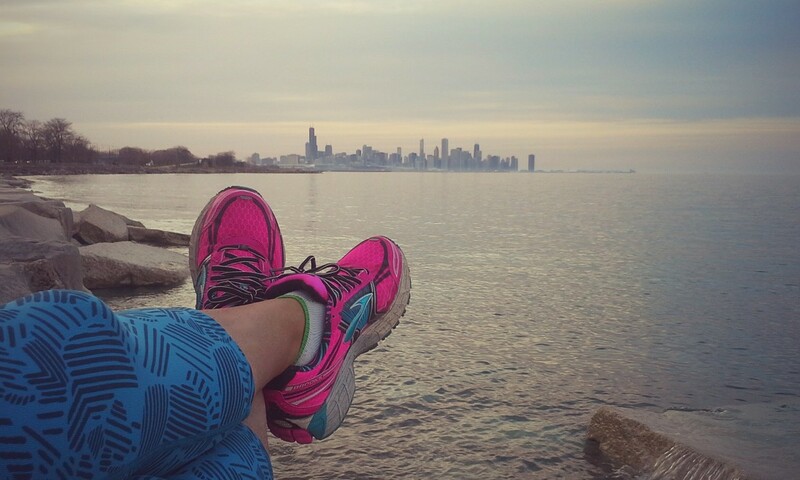 We picked up race packets at the Fleet Feet store in Elmhurst the weekend before the race. The race registration cost was $44 when I registered, and I think the race sold out. The packet included a long-sleeved tech shirt shown in the pic above (sort of loud looking) and a Ram Racing drawstring bag. 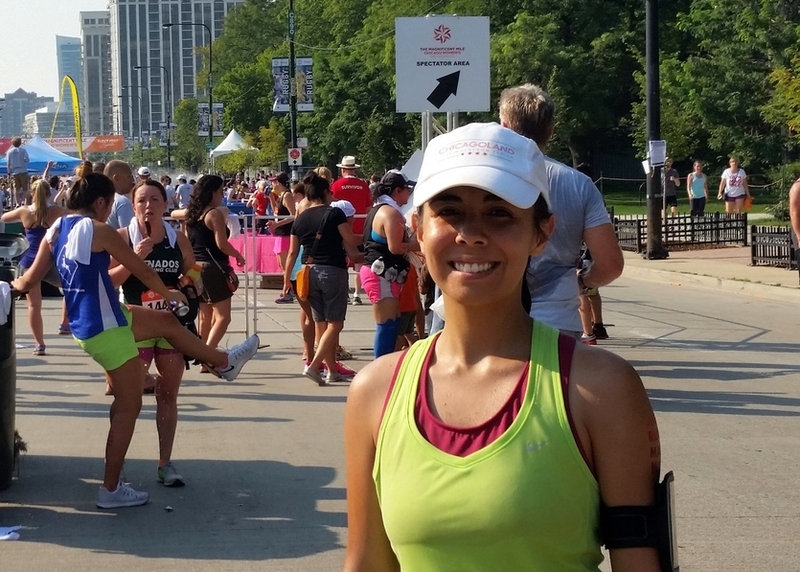 This year there were 4,337 people who finished the race, 2,924 of whom were women (whoa 67%). 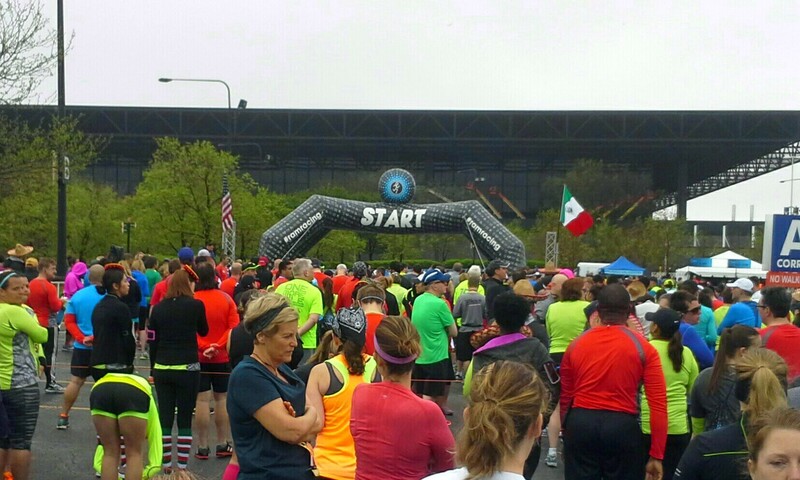 This was a pretty big race, I think, for a run on the lakefront trail. The start was done in waves by corral, 3 minutes apart. This worked ok, except the very beginning of the race went through the McCormick tunnel, which was super dark and full of water/potholes. It was hard to see, especially given that people were still bunched up at the beginning of the race. It would have been nice if there were extra lighting in there- it seemed sort of dangerous, and I’m glad I didn’t trip or misstep or anything. But after that short dark bit, the rest of the course was fine. 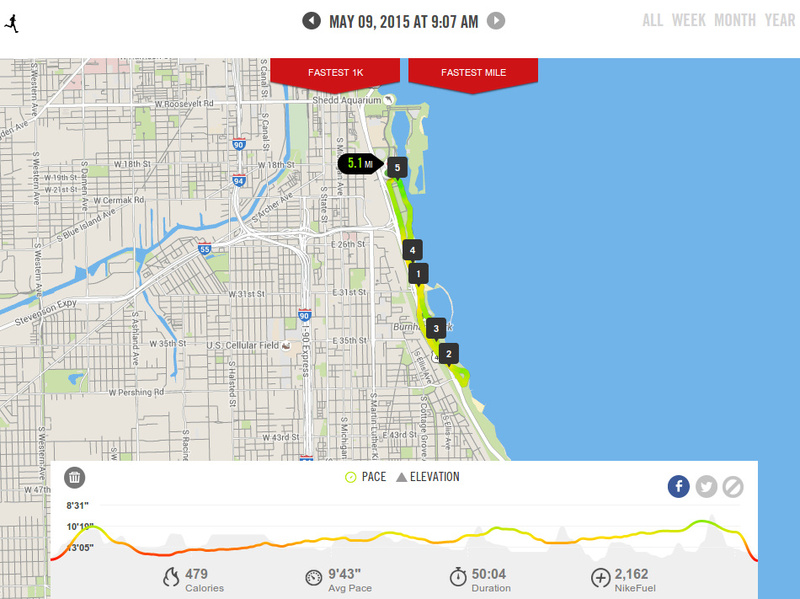 The course ran down the lakeshore drive a bit, over to the lakefront trail, and back up. There were clocks at every mile marker, which was really nice. Cinco de Miler course map. So happy with my negative splits!! I decided in the first mile that I felt pretty good so would try to go for about a 10’ pace. I finished with an official finish time of 49:25, which put me at a 9:53’ pace, comfortably under my target goal. My Nike+ also clocked my pace as 9:43’ and a slightly longer distance than 5 miles, so I was happy that I was faster than usual. I also ran my fastest mile ever in mile 5 (9:18), so super happy. So this was also the first time I ended up above average in every group. Woot! After the race, we ran straight into a long finish chute where I grabbed gatorade, a water bottle, and a chocolate churro (YESSS!!!!!!!). Headed over to the food tent for my tamale and chips and salsa, and the beer tent for a can of Modelo. Didn’t stay too much longer after finishing up food/beer since it was getting super cold, but there were a lot of neat activities including pinatas (benefiting the 100 Club of Chicago for each one busted), a mechanical bull (yikes, seems like your legs would be pretty sore to do that post-run), and more inflatable things for kids. Me with my latest bling. Fast day for me, so, happy race! Super happy with my negative splits. 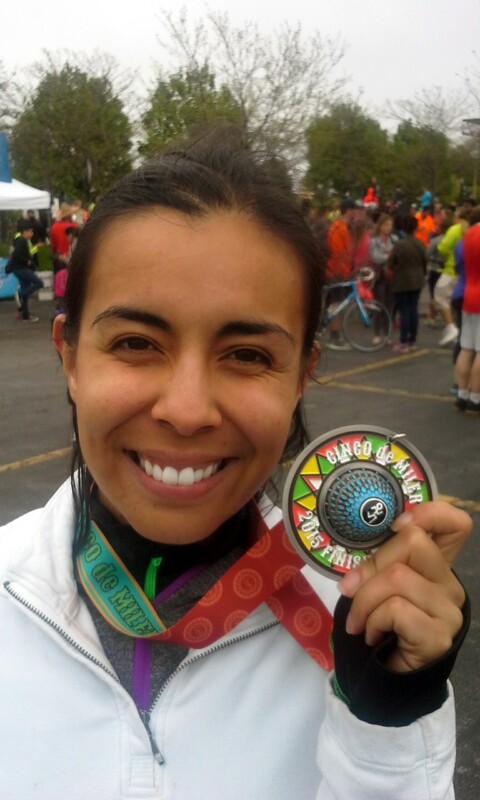 The weather was pretty icky, but at least it didn’t rain during the race itself. Churros at the finish- probably my favorite post-race sweet I’ve had. The medal is super neat and is a real hefty bottle opener. 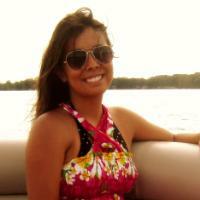 The five mile distance was nice and easy for me (now), and I had good energy at the end. Bit weird/uncomfortable to see a bunch of people with fake mustaches (it seems a bit culturally insensitive, I would think, just my opinion), so I didn’t think that was too fun. Also, there were a bunch of people in day of the dead makeup- sooooo, think people aren’t too familiar with what Cinco de Mayo is. I may or may not do this one again next year, but I did enjoy myself overall.